Following a number of disparaging remarks about the future of the Electronic Entertainment Expo from, amongst others, veteran games developer David Perry and EA's CEO John Riccitiello, Bethesda's Pete Hines has gone on record defending E3. Bethesda, considered by many videogames critics as the darlings of the last two shows following the much-talked-about demos of their magnum opus, Fallout 3, are a little more measured in their thoughts about the future of E3. 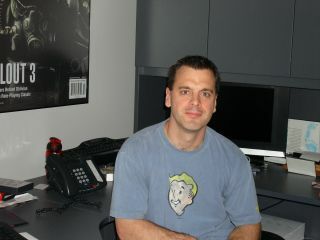 We asked Bethesda's VP of marketing, Pete Hines (pictured) what he thought of E3 as a whole? "I'm a firm believer that we need an E3," Hines told TechRadar, "and I say that having just suffered through it, so I assure you the pain and wounds are still fresh!" Does he feel that the show still has plays a valid role in the industry? "We just can't have it like this year," Hines told us. "It either needs to go back to an improved version of last year, or something closer to what it was but perhaps with some controls and boundaries put on it so the bigger companies aren't strapped with trying to outdo each other with booths the size of a small city." What of the announcements from the big three hardware companies. What did Hines feel was the most interesting news from the press conferences? "I thought the most interesting was Microsoft's because I didn't know about the whole revamping of the Live Dashboard," said Hines, adding, "Avatars aren't really my thing, but anything that streamlines the current experience works for me." And as for his favourite personal moment of E3 2008? "I don't have just one. My faves are having the Fallout 3 demo start off the Microsoft press briefing, our party on Tuesday, seeing The Who play at the Rock Band party, and – finally - the moment it was over!"